Google is the best search engine in the world. People think that Google’s popularity is due to its simple and fast searching interface, but friends, it’s more popular because it has rich operators and query support that will make your searching experience much better. Most of us don’t know which operators are supported by Google. Today, I will show you how we can search Google like elite hackers, or computer experts. To do this it is necessary that you should understand all the Google operators. So let’s learn how we can enrich our searching experience in Google. 1. Basic Google Operators such as: “and” “or” “not” etc. 2. Advanced google operators like “inurl” “intitle” etc. I am also including bonus search queries that are extremely useful for hackers. 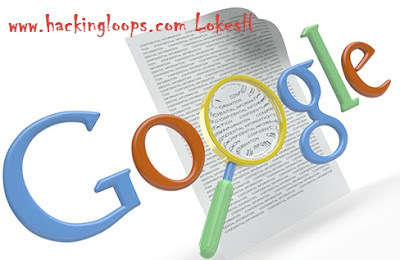 1) And ( ) :- This operator is used to include multiple terms in a query which is to be searched in Google. example:- if we type “hacker yahoo science” in the Google search box and click search, it will reveal the results which are related to all three words simultaneously i.e. hacker, yahoo, and science. 2 ) OR (|) :– The OR operator, represented by symbol( | ) or simply the word OR in uppercase letters, instructs google to locate either one term or another term in a query. 3) NOT :- The opposite of AND operator, a NOT operator excludes a word from search. example:- If we want to search websites containing the terms “Google” and “hacking” but not security, then we enter the query like “google hacking” NOT “security”. Description:- “intitle:hacking” returns all pages that have the string “hacking” in their title. intitle:”index of” returns all pages that have string “index of” in their title. Description:- “inurl:admin” returns all matches where the url of searched pages contains the word “admin”. 3) Site :- This operator narrows search to specific website. Description : It will search results only from given domain. Can be used to carry out information gathering on specific domain. It gives various definitions for the word “security” in different manner from all over the world. Description- Active WebCam is a shareware program for capturing and sharing the video streams from a lot of video devices. Known bugs: directory traversal and cross site scripting. Description- AspJar contains a flaw that may allow a malicious user to delete arbitrary messages. The issue is triggered when the authentication method is bypassed and /admin/delete.asp is accessed directly. It is possible that the flaw may allow a malicious user to delete messages resulting in a loss of integrity. Description- This search gives hundreds of existing curriculum vitae with names and address. An attacker could steal identity if there is an SSN in the document. Description- Secret financial spreadsheets ‘finance.xls’ or ‘finances.xls’ of companies may revealed by this query. Description- The robots.txt file contains “rules” about where web spiders are allowed (and NOT allowed) to look in a website’s directory structure. Without over-complicating things, this means that the robots.txt file gives a mini-roadmap of what’s somewhat public and what’s considered more private on a web site. Have a look at the robots.txt file itself, it contains interesting stuff. However, don’t forget to check out the other files in these directories since they are usually at the top directory level of the web server! Description- Locate “admin” directories that are accessible from directory listings. Description- Returns lots of proxy servers that protects your identity online. Note: This is not originally written by me. Thanks to Unknown and Google Search Guide. If you have any queries ask me in form of comments. Thanks for reading.